Buenavista Golf is situated in the extreme North-Western corner of Tenerife, close to the spectacular Teno mountain range. The new course was designed by the legendary Seve Ballesteros, who is extremely proud of the project. Since its opening in 2003, Buenavista has emerged as a real favourite for golfing visitors to Tenerife, with a number of truly amazing holes. We found 18 offers matching your search. From the championship tee markers, Seve's creation measures 6,582 yards, but with the coastal location and proximity of the mountains, the coastal winds can play havoc with club selection and judging distance. Buenavista is also fortunate enough to have a dedicated golf school, which adheres to the principles that Seve engendered throughout his career. With that in mind, you might start missing some fairways, but your short game is sure to be sharp! 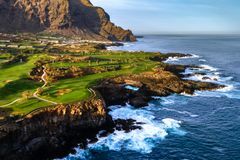 This amazing golfing destination is a must for anyone looking to explore Tenerife's rich and varied golfing landscape, and will be a highlight of your next golf holiday. Fairly busy in the morning so pairs are joined up. Took over 4.5 hours most days. Great course, cleverly laid out but greens take some getting used to. Tough for higher handicaps and probably too short to trouble low handicaps. We loved it though and will be back I hope. A really stunning course right on the West coast of Tenerife.Designed by Seve it has 3 par 3s, 3 par 4s and 3 par 5s on each 9 holes. The waves crash in on the cliffs next to the course and the vegetation is amazing. It is quite a tricky course...we played better when we paid for a buggy(41 euros & was worth it), bottles of water included. The Golf Club will store your clubs (no charge) and the minibus to take you back 300-400 metres back to the Hotel was very punctual. The food in the clubhouse is lovely and very good value. A Rosado was only 2 euros. Sorry, your filter options returned no results.